Former Dallas Cowboys quarterback and current high school football coach Jon Kitna spoke at the Waxahachie Lions Club on April 28. He discussed how he is going to plan and develop the Waxahachie High School’s football program over the next few months, as it is his first year as the head coach for the school. Kitna will also shared his vision for how he and the other WHS coaches plan to positively influence the students and players on campus to succeed at their goals and achieve their dreams. As the head coach, Kitna is bringing down two other people with him this year to help with the team, Evan Brady and Mat Kitna. Brady will be the assistant head coach and Mat Kitna will be the offensive line coach. The Washington native got his football career started at Central Washington University where he was the quarterback for three years and even led the team to a NAIA Football National Championship. He was signed on as a free agent by the Seattle Seahawks in 1996 but went on to play in in the NFL Europa league for Barcelona during 1997 and most of 1998. Once he returned to the United States he played with the Seattle Seahawks, Cincinnati Bengals, Detroit Lions, and Dallas Cowboys until his retirement in 2013. Kitna spoke about all the great things that the high school can expect to see happen both on and off the field this year from the players. A man with his experience is going to have a lot to offer this coming school year. 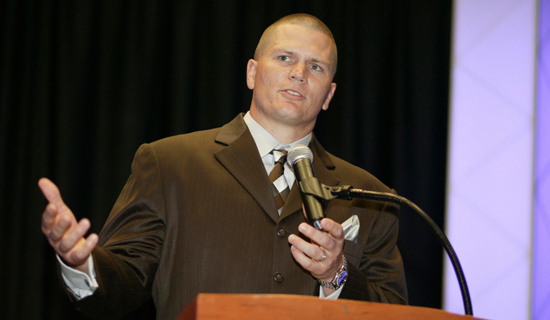 If your company is interested in finding out availability and booking fees for a former NFL player like Jon Kitna or other sports celebrities for a Keynote Speech, Charity Event, Personal Appearance, or Football Camp, call us at 1-888-246-7141.